At 6 o’clock came the wake-up call. The morning was fresh and nice. The inhabitants of the villa district Malabar Hill through which we were driving seemed to be still in deep sleep as everything was quiet in the villas and gardens. The destination of our drive was the cemetery of the Parsi, the famous “Towers of Silence”. One of the most respected Parsi, Sir Jamsedji Jijibhai Bart., as well as Mr. Nüsservanji Behramji, received us at the foot of the hill and guided us over long stone stairs to a blooming garden that did not disclose the presence of a cemetery nearby. Close to the entrance gate sits a dog that has two supplementary eyes in color above the natural ones. The dog’s comportment according to the Parsi beliefs depends whether the dead enters the other world under good or bad auspices. If the dog looks at the dead person, this is regarded as a good sign while the opposite is seen as ill fortune. Just at the entrance to the garden stands a temple in which the whole fire is burning which, they say, the Parsi have brought from their ancestral homes and which has been kept alive ever since. Continuing on the garden, one meets five flashy white towers round as a circle. The tallest is 7.5 m high and has a circumference of 90 m. On its rim sit a legion of vultures and ravens. Up a few steps lies the entrance by a small iron door. One is allowed to approach the temple only up to 30 m but a model in the garden offers information about the interior of the burial place. Within the towers constructed with much effort – the largest is said to have cost over 360.000 fl in Austrian currency – is a cone-shaped platform terminating in a duct separated into ring-formed divisions. The outer division is intended for men, the middle one for women and the interior one, closest to the duct, for children. Four guardians, the only people allowed to enter the temple, undress the dead and lay them out in the proper division. 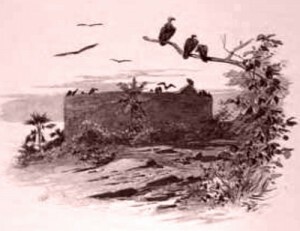 Immediately hungry vultures set upon their prey and within an hour the body has been consumed except fort he bones. The sun dries the skeleton which is then lowered down the duct and poured over with water and chalk. The duct leads to four radial canals equipped with coals and sand filters ending in large pits where the last remains of the skeletons are left to their fate. “Anyone belonging to Ahab who dies in the city the dogs shall eat, and anyone of his who dies in the open country the birds of the heavens shall eat.” (1 Kings 21:24). What the prophet Elias said to the king who had laden himself with a large guilt through his wife Jezebel, as a punishment has here become a horrible reality, a terrible truth. The birds of the sky eat the dead, devour the just and the unjust, nobles and inferiors. “Erectos ad sidera vultus“ all those who lived are now in death carrion for the birds. From this place of human abasement bereft of all piety, where the winged gravediggers croak a dark “Lasciate ogni speranza”, thoughts are fleeing to the churchyard in the native mountains. Here, the precious dead lie in the earth that covers them protectively in order to fulfil the word: “for dust you are and to dust you will return.” Over the graves are set crosses, simple wooden crosses but built and erected with care, with the love the living have received with a smile and now with tears speaks to the dead: “Rest in peace.” Thus in thoughts, we departed from these eloquent Towers of Silence. The next visit was to the animal hospital Pindschrapol which was founded by rich Hindus. A complete aberration of religious sentiment! Innumerable animals without owners, sick, covered in hideous eczema, with wounds of all kinds are spending their time until death – more merciful than those men in their aberration of the prohibition of spilling blood out of a feeling of pity – takes them away. In a courtyard stood, like biblical sisters announcing a famine, about four hundred cows. In the next courtyard, horses, real nags, in a third courtyard behind bars, dogs, monkeys, sheep, parrots, chicken, doves, myriads of flies and gadflies buzzing in a choir of pain and plague. A more pleasant view was the large Crawford Market halls. They are said to cover with courtyards and gardens an area of 60 hectares and are built in the European manner out of stone, iron and glass. They are divided by a central hall with a 43 m high bell tower into two wings and a row of individual market places. The right wing of the market halls is for flowers and fruits, the left one for vegetables and spices. There our attention was caught by majestic roses, Chrysanthemum, Jasminum, a variety of exquisite bananas, trees with apple-like fruits, and mangoes. Also the strangely colored and formed pumpkins and cucumbers, Curcuma roots, Cardamom as well as spice mixtures well known to the European gourmets as curry powder. Also samples of the local smoke and chewing tobacco etc. In special halls are offered fish, cow and sheep meat as well as chicken. The large fish market displays hundreds of sea fruit, from the small Bombay ducks (Bombil) to vast monsters which the local palates will still find tasty. Living animals are sold here too. We took this opportunity to increase the ship menagerie with mynas, parrots and a green leaf bird but we could not come to terms easily with the local merchants. While the scented, rich market hall full of vegetables of all kind with its diverse activities of supply and demand presented a picture of life, so the next encounter we witnessed, a Hindu burning, was a dark counterpart for us. Seeing the destruction of a body bereft of all sensual matters, the dissolution of matter in a handful of ash. Mr. Tribhowandas Mangaldas Nathubhai, President of the “Bombay Hindu Burning and Burial Ground Committee” and a number of its members received us when we entered the burial place. The location and even more the behavior of the mourners at the ceremony does not show any form of piety. In an oblong courtyard on whose end stand banks and chairs are moored four iron poles a meter high in a distance of every ten meters. In between, the wood for the burning of the body is stacked. Out of the rest of one of the burnt pyres, two Hindus were collecting ash and burnt bones with complete indifference to dispose those scarce remains of a human body in a vase decorated with flowers that is then thrown into the sea. I just wanted to go when I heard singing and cymbals. A funeral procession was entering the courtyard. In front marched singers and musicians, then on two bamboo sticks, only covered with some bands, the body, borne by four men. Relatives made up the rear of the procession and showed no exterior sign of emotion or compassion, not even as lucky heirs – only indifference, terrible indifference. The music which was insulting to the ears starts even during the final hours of the dying as it is intended to assist the magic to drive away bad demons of sickness. What failed to work against these might nearly have driven us away. But we were asked to take a seat on the banks and could now observe closely the act of burning the body. The body of a very tiny young woman was covered completely in red cloth, sprinkled with a red powder and decorated with flowers. The poor woman must have died only hours ago as the body had not become stiff. It is Hindu custom to burn the body only shortly after they had expired, a practice which makes the job of the district coroner harder to note deaths, especially in the case of high numbers during cholera epidemics when it even becomes impossible. Often Hindus only inform the authorities of a death after the burning of the body has taken place. A cholera epidemic is often a good opportunity for Hindus to poison an obnoxious person with arsenic ,which triggers symptoms similar to those of cholera, or opium, burn them quickly and announce it as a cholera death. During earlier times when the authorities were not used to examine with vigor, the killing of girls with opium was a common practice which resulted in a huge scarcity of women in some parts of India so that the remaining few resorted to polyandry. The body of the young Hindu woman was laid on the earth, water was poured over it and carried three times around the prepared pyre by the husband and a relative, then the mourners laid down wheat and sugar on the body and set it down on the pyre with the head towards the east where she was covered with six large logs. With a fire carried along from their own hearth in an urn the husband ignited sandalwood, walked three times around the pyre carrying the burning wood and touched each time the toes of the body which lay exposed from the shroud and finally set the kindling and the bundles of straw at the head of the dead on fire, igniting the pyre. In that moment, the husband cried out with hurt emotion, perhaps more for us than for his own feelings until his apparently less emotional relatives took him away. The pyre was burning, crackling, smoking. Eagerly the fire consumed the victim as if it wanted to take it away from the indifferent glances of the humans. A second funeral procession approached. Again the dead was a young woman, apparently from a rich family of higher caste. Without a veil, the young deceased lay on the bier. The rosy tint on her cheeks indicated that she had only recently passed over to the empire of death. Having seen enough of this cruel spectacle, I turned to go. At the exit of the burial place there is a house in which rich mourners of the highest caste wait for the ceremony to end and often call for dancers to shorten their waiting time – a revolting want of tact. Quickly the dead must pass on into nothingness, making way for the coming generations: The Parsi devoured by the birds, the Hindu by the fire and thrown as ashes into the sea – in the animal hospital however the poor animals are kept artificially alive in their suffering, for them earth offer space and humans compassion. To fully make use of the morning we visited also the Natural History Society’s museum which offers under the direction of Mr. Phipson a vivid image of India’s fauna. Right at the entrance crocodile hides, giant buffalo skulls and some living Indian squirrel catch the eye. Numerous cabinets hold the most important specimen of birds as well as countless butterflies. In containers filled with alcohol swim hundreds of different snakes and scorpion species, spiders, beetles and walking leaves which are part of the locust family. Numerous abnormalities and rarities are special attractions. Antlers of capital Sambar deer, abnormal horns of gazelles and black bucks, various skins of bears, tigers, panthers, snow leopards and other already bagged Indian cat species. A Hindu boy’s foot recovered out of the stomach of a crocodile, giant snake hides (python), scorpion twins, a collection of living snakes, a green whip-snake and two cobras that constantly start off against the walls of their glass enclosure. Special recognition is due for the installation of the objects according to the needs of science but also out of love for nature which goes beyond dry annotation and classification and always strives to bring all objects closer to the viewer’s understanding through placing them in a systematic and tasteful context, and by alternating them with trophies, pictures and photographs comprehensible to the layman. Mr. Phipson offered kindly to supply me with a number of spare birds for my collection, an offer I gladly accepted. Vividly satisfied from the impressions of the exhibition I drove to Mr Tellery (S. J. Tellery & Co.), a compatriot in whose shop all industrial art products of India are represented. This place is a real temptation for the eager shopper. Everything manufactured in Bombay, Madras, Haidarabad, Maisur, Agra, Dehli, Benares, Calcutta, Afghanistan and Birma has been made accessible there. Statues of gods and idols in bronze, silver and marble; vases, plates, cups made out of copper or gilded bronze, carvings in ivory, inlaid sandalwood boxes, Kashmir blankets, Fulkaris from Penjab, cloth with designs with applied wax glitter from Peshawar, printed calico from Madras with illustrations out of the great Indian epics Rämäyana and Mahabharata, tulle for dancers woven in Dakka, rugs from Bijapur with the famous peacock and shikan pattern, weapons and signs, elephant spears and halberds, musical instruments, small tables and Qur’an stands – a complete chaos of the most enticing things. Soon I gave in to temptation – a whole wagon-load was brought back on board which made the responsible officer despair. With loving care for our material health, consul general Stocking invited me and my entourage to lunch in the house of the Bombay Yacht Club, an enticing call we willingly followed. The yacht club is situated within the “Fort” in an airy house at the edge of the harbor on Apollo Bandar, within a garden and having a lovely view on the harbor and the islands on the opposite side. This made the lunch even spicier and the rest afterwards sweeter. Refreshed we drove in the afternoon with a fast steam launch of the navy yard from Wellington Pier across the harbor to the 10 km distant island Elephanta, famous for its rock temple. During the trip one can enjoy the view of Bombay , of the islands and thanks to the intense light the contours of the mountains on the mainland. Going on land at Elephanta causes some difficulties as one has to transfer first into smaller boats and has to balance over different smooth and slippery concrete blocks. A non-punishing walk under palm tree brings one, after climbing long stone stairs, to the temple of Elephanta. Lingering young Hindus make up the living background and offer for purchase nests of bayas to the travelers as well as matchboxes with various beetles and cherry stink bugs that shine gloriously metallic. Elephanta island, also called Gharapuri, city of caves, is worth a visit alone for its rich vegetation that displays itself to the visitor’s eyes drunk in colors. This island is full of palm trees, lianas, tamarinds, banana trees, bushes and flowers enchantingly formed and colored, with rare butterflies, glimmering beetles, flashy birds flying around. Even though nature has richly given treasures of the fauna to this small gem of the archiple of Bombay, the main destination of this trip to this island is an ancient home in the midst of the island for those gods that create, maintain and destroy. The island owes its name to the ancient colossus hewn into stone in a distant time. These statues now stand in Victoria garden next to the Bombay museum, weather-beaten into chunky masses so that one can barely recognize the famous masterwork – a giant elephant fighting with a powerful tiger. The large temple caves still exist in whose shadowed light are kept safe many holy artifacts of Indian gods all with Brahmin legends of their own. Guided by an English veteran soldier with a medal of honor who serves here as Cicerone, we went down into the temple caves. Like the elephant colossus, once the guardians of the temple entrance, the lobby has become a victim of the elements during the centuries too. Only the temple itself, guarded by mother nature herself, still exists. It is divided into different parts. The first is dedicated to the god of earth Shiva (Mahadewa), creator and destroyer at the same time. On the opposite side to the entrance to the main temple borne by a double row of pillars stands the decorated pillar of Trimurti (trinity) which shows Brahma, Vishnu and Shiva. As symbols, this trinity is carrying a drinking vessel, a mythical lotus flower and a poisonous spectacled cobra. The walls of the temple are covered with sculptures showing scenes from the life of Shiva, his birth, the marriage to Kali (Parvati) and other sometimes frightening scenes. Three smaller square domed buildings contain each a lingam, a symbol of nature created. On the left side of the main temple lies the temple of the elephant god and god of erudition, Ganesha, whose sanctuary is decorated with images of his many wives. All pillars are arranged symmetrically and the pictures pay much respect to the anatomical relations and are in part artfully done so that the completion of these works and even more the construction of the enormous temple halls make us marvel. The rooms, covering an area of 1564 m2 constructed during a time without modern technology, machines or explosives, had to be excavated out of the hard granite rock only with hammer and chisel. A few hundred years ago these holy halls were inhabited by Brahmins, their followers and the dedicated temple singers and dancers. Without interruption, multitudes of believers, namely women seeking fertility, came and went. The Portuguese in their holy fervor chased the “tax collectors and scribes” out of the temple during their occupation of East India. If one believes the stories, they even tried to destroy the temple with cannon shots, obviously overkilling it, and thus damaging the ancient art on this monument, in part even destroying it. Today, pious Hindus still make a pilgrimage with their families from time to time to Elephanta temple on holy days, to that witness of a majestic past. Much more eagerly are these impressive remains of a glorious art work observed by the foreign traveler who will find knowledge and pleasure there. The end of the day was devoted to the attendance of grand official festivities in Government House. The dinner was followed by a ball to which the high life of Bombay was invited. For me this assembly of the leaders of the “upper ten” was not only interesting from a social point of view but also as a choreography because the English custom of pleasure dancing is different from the one we use. Especially one imported dance called a barn-door dance, accompanied by monotone music, straddles the middle between a haltingly dance mazurka and a bear dance. A honorary quadrille that I performed with Lady Harris did not really work as the figures performed were unknown at home. Lady Harris did not really appreciate this, while Lord Harris found the funny aspect in this situation. As in our square only the wives of the highest dignitaries and the civil servants of the top salary class were invited, multiple centuries were present in a small space, so that I thought longingly about a quadrille I danced at home. For the rest, I abstained in view of the challenges of the coming days. After midnight, a supper was served during which I had to pull crackers with Lady Harris in the center of the hall to the amusement of all. 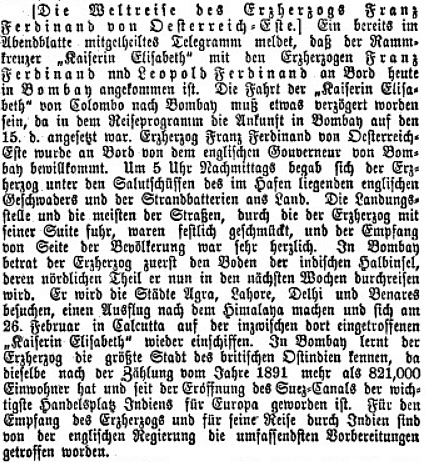 ANNO – on 18.01.1893 in Austria’s newspapers. 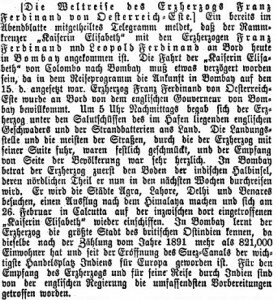 Back in civilization in Bombay, the readers of the Neue Freie Presse are informed about Franz Ferdinand’s activities of almost the same day. The k.u.k. Hof-Burgtheater is playing Schiller’s „Maria Stuart“, while the k.u.k Hof-Operntheater is repeating „Romeo und Julie“. Dieser Beitrag wurde am 18. January 2018 von wordpressadmin in diary veröffentlicht. Schlagworte: Bombay, India, sightseeing.